Did you ever wish you could share what you’re looking at on your computer screen right now with someone else? Maybe you just beat your all-time high score in Solitaire, or you really like the new theme you just installed on your desktop. Did you know that you can make an image of anything that is displayed on your computer monitor, including Web sites, files, and pictures, manipulate it, and save it onto your hard drive in a format that’s easy to email or upload to the Internet? Taking a screenshot, as this is called, is very easy. Look at your keyboard. At the very top row of keys, over to the right, there’s a key that is labeled “Prt Scrn/Sys Rq.” To capture a screenshot, press and hold down that key and the Shift key (or the Alt key to capture only the active window). Release. Whatever was on your monitor is now stored on your computer’s clipboard in virtual memory, which means you’ll lose it when the computer is rebooted or turned off, or when you take another screenshot, unless you save it. The easiest way to save the file is to paste it into Windows’ built-in graphics editor, Paint. But if you have the latest version of Google’s free photo and image editing software Picasa, it can be a very flexible helper when it comes to capturing the contents of your screen. You can set Picasa to be the default handler for screenshots, and then every time you take one, Picasa will automatically detect it and save it as a .jpg file in a folder called Screen Captures, so you don’t have to remember to. 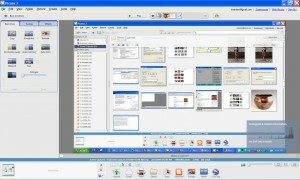 Picasa also displays a clickable tab whenever you perform a screen capture that will open the image for editing. From there it is very easy to crop, rotate, flip, scale, and/or add text to your screenshot. You can even apply Picasa’s built-in effects like soft or spot focus, greyscale, saturation, or sepia-tone. When you’re done editing the file, attach it to an email and send it off to impress all your friends with your Solitaire skills – and your screenshot skills too. Hi. Very interesting article on saving/editing screen shots. Can you please tell me how I can set ‘picasa’ to act as my default for such shots? I would love to know how to do this, as Picasa only save it as BMP. You can convert it to .png or .jpg but manually, editing the files. precisely. 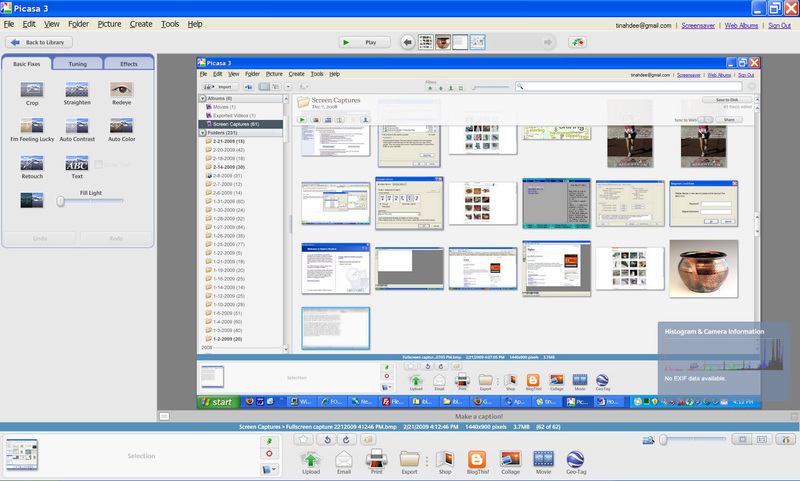 The problem with graphic usability of Picasa is in several places among which two of otherwise standard options of graphic software are absent in Picasa – first being no choice for format of the data saved, and the other its destination. Saving large BMP files on drive C is plain wrong, for anyone dealing with a larger numbers of images, and these days many of us do. Not having a choice where to keep all these data is simply cripling this otherwise interesting software. I stopped using widely Picasa just for this reason. I can live with BMP, as I process files in batch of Photoshop anyway and it allows me to get the maximum resolution form final images, but having always to clean up C drive and move data manually kills my productivity. We need a good update for Picasa – one that will give user this vital configurability of this program. We want to be able to choose at least jpg and bmp (I would strongly advice to add png to the list), and choice of output directory. One of the best functions of screen capture in Picasa is its ability of taking multiple screen shots just by pressing the key. If we work with on screen processes when we need to follow the process and just pick screen shots at the right moment this function is invaluable. Google did a lot good in this program, just stopped very short of winning, what a pity.